We all like saving money right? 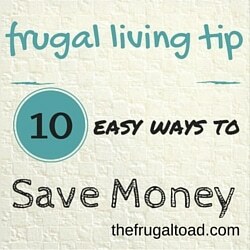 Here are 10 ways to save money that you may not have thought of. When traveling on the highway use cruise control and keep your tires properly inflated. Together you can save money on gas by improving fuel economy by 12%. Save money on dry cleaning by buying a hand-held steamer ( Target $29) . Its easy and it keeps your dry clean only garments looking great in-between cleanings. Steam 4-5 pieces of clothing and it's paid for itself. Have fresh herbs that are about to go bad? Chop them up and place in ice cube trays with water and freeze. Add the frozen herb cubes to soups or dishes when you want that fresh herb flavor. Ask your doctor for free samples. Most doctors are happy to give you free samples of medication that you need. Paid off that credit card? Continue writing the check but instead send it to a savings or investment account. Thinking about a large purchase like a new TV or a second car? Save up and pay cash. During the time you are saving it will give you a chance to decide if you really need it. If you decide to make the purchase by paying cash you avoid finance charges. Brown bag it. Make extra at meal time and pack the night before for a cheap lunch. Skip the drinks and dessert with meals and order water instead! You can cut your bill by 25%! Instead of taking the family out for an expensive dinner and a movie, start a tradition like Family Fridays. Have a BBQ on the patio and play games or watch a favorite movie. You will build lasting memories with the family and save a bundle in the process! Once a month review your finances for additional ways to cut costs. By putting it on the calendar you will get in the habit of reviewing your spending habits and you'll be able to make adjustments before they become major problems. Readers: What easy ways to save money can you think of? I Have My Financial Bucket List, What About You? Great ways to save money! I would also add eliminating that daily or weekly Starbucks fix. The savings really add up!